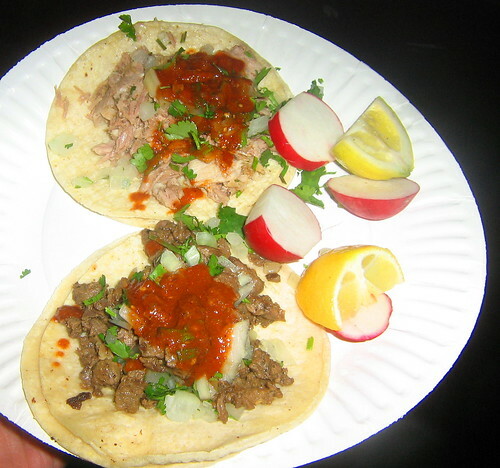 Rambo's tacos in Eagle Rock is one of LA's most well known taco trucks. I always thought that John Rambo would have made a great taquero. Thank god I'm not the only one. The tacos are small and tasty. Each come with a dollop of salsa roja. The roja is peppery, not too spicy but there is enough chile flavor to warrant having a beverage handy. If you order the carne asada you won't have to worry about any fatty bits, these tacos are lean and tender. The pastor leaves alot to be desired though, while the pork isn't fatty there really isn't anything al pastor-ish about it and even the salsa can't save the dryness of the pork. The carnitas has subtle flavor to it and it first I thought that it was too subtle..that the lack of flavor was a negative but it actually really works and the texture of the pork and onions and cilantro goes great with the dominant flavors of the salsa roja. But my money is with the carne asada. These tacos will quench any taco fix you may have. 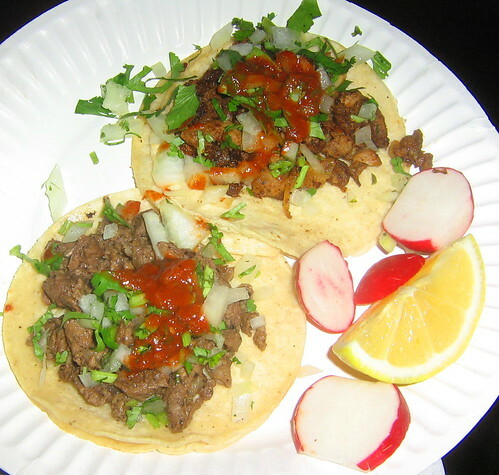 Ask for some extra salsa on the side, squirt some lemon over your plate of tacos and have at it. 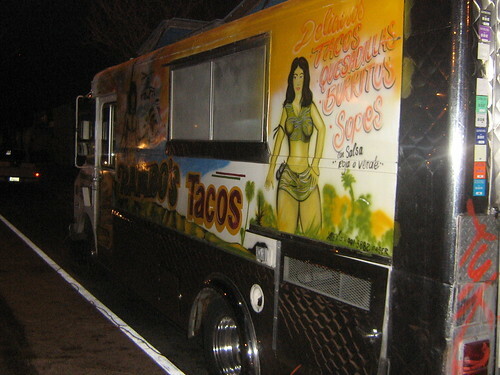 Rambo's nearest competition is Leo's Taco truck which parks a few blocks away. Some locals prefer Leo's, some prefer Rambo's. If it's monday Rambo is the only game in town, Leo doesn't like mondays. I heard monday was the night Leo goes dancing but the person that told me that likes to make up stories. That pastor doesn't look very pastor-y , what's up with that? Good spot though, I've hit it up but it was back in the carne asada only days-- I didn't dig on swine back then but taco trucks have changed my tune. I just started reading your food blog, but in defense of Rambo's, I recommend trying their lengua, tripas, and cabeza, which are quite good. I've eaten there dozens of times in the past few months (I live down the block), and I've found them to be hit or miss. When it a "hit" though, their tacos are excellent.